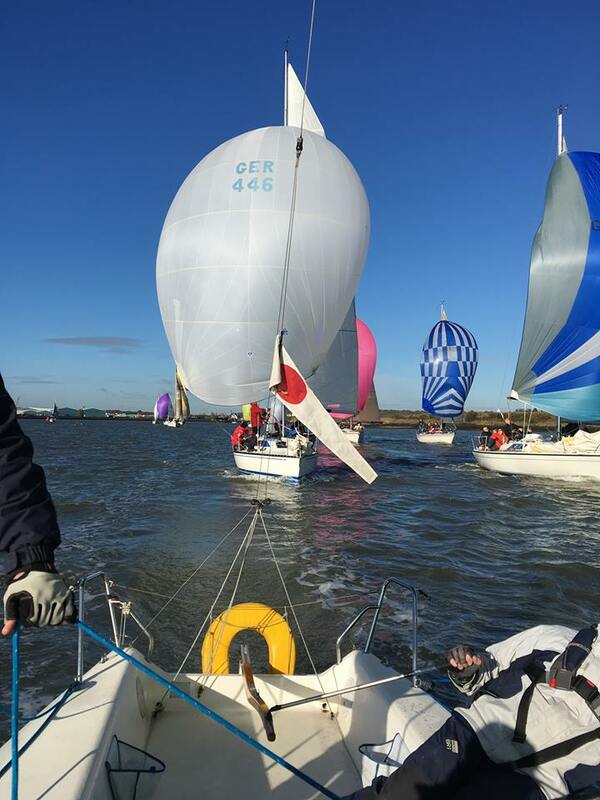 A West-North-West wind failed to provide a “Hitchcock style” thriller for crews competing in race 4 of the Pirates Cave sponsored Medway YC Cruiser Autumn Series. What we did get was a cold, bright morning with a light breeze fluctuating between 6-15 knots and a flooding tide throughout the race. The fleet of 27 boats across Class 1 and Class 2 were sent on a short windward leg up river to bouy 30, before heading down river on their respective courses. 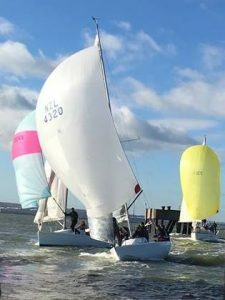 The conditions favoured those with consistent boat speed, light displacement and/or large expanse of asymmetric or Code 0 sailcloth. Also – a willingness to sail in the shallows helped on the 2nd leg. Full Tilt (Arcona 400), Hellaby (1/4 tonner) and Jemini (J80) ticked all, if not most of these requirements! 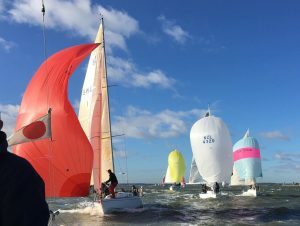 With four of the five races now completed, crews are looking closely at what results they will be discarding at the end of the Series next week. Whilst Ross Eldred “Full Tilt” has sailed solidly in every race to be the de-facto lead boat on the water, it is Clinton Lyons Delher 34 “Big Zipper” who has so far posted a solid 2, 1, 1, 2 before discard in IRC. Almost equally consistent under IRC is Robbie Stewart in his well sailed 1/4 tonner who holds a 1, 2, 5, 1 scorecard in comparison. In NHC Class 1; Big Zipper is equally consistent but a number of boats could put a solid series together next week, once the discard kicks in. Class 2 NHC is clearly a fight between Andy Eakins Scout (Int. Folkboat) and Ynot; the modified Splinter 21 owned by Tony Owens. Both boats will be pushed on the final race by Petite Fluer (Ecume De Mer) and Suntrek (GK24). With high winds hitting the UK next week, owners will be checking the forecast regularly and boats heading for class wins will no doubt be eying up the prize vouchers from our generous sponsor “Pirates Cave”. 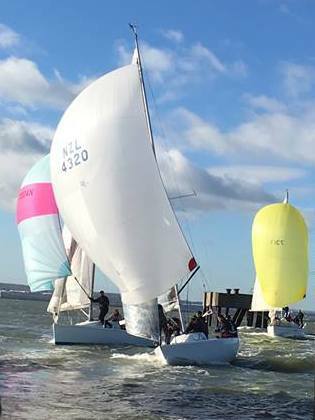 Race 3 of the “Pirates Cave” sponsored MYC Cruiser Autumn Series was held on Remembrance Sunday, which delivered bright skies and a NW / NNW building breeze, ranging from a low base of 17 knots and gusting to 27+ knots. With the forecast for more wind later in the afternoon, PRO Mike Wallis was keen to keep Class 1 and 2 in the same stretch of water. So a common course was chosen for both classes, but with Class 1 having to do… the course twice. 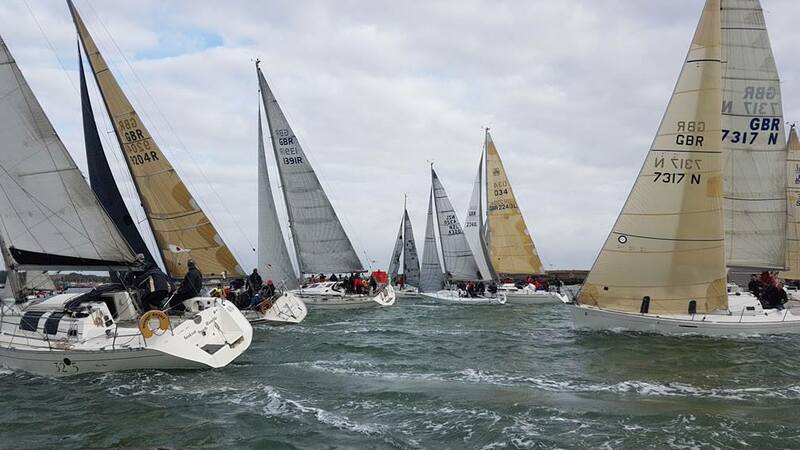 From a committee boat start at bouy 26, a windward leg against the Ebb tide took the fleets back up to bouy 30. The Medway boats are proving very game for “nip and tuck”, with some aggressive calls of “starbooooard” being heard; which is an indication that owners and crew are taking the racing more seriously as each race passes. The short crewed Full Tilt (Arcona 400) led the fleet around the course, which took both classes down river with the ebbing tide to 15, West Bullock and 16, before back up river via 18, MYC4 and MYA1 to the finish or round 2 of the course for Class 1 boats. All boats trying to get out of the tide as best they could. It was noticeable that Flying Fish (First 40.7) is getting faster and faster as its crew get to know the boat, so perhaps by Race 5 we will have a different path finder boat to lead the fleet around the course. Full Tilt will be looking over their shoulder if this occurs. 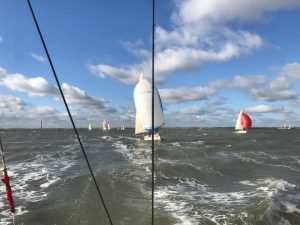 Back in the main fleet we saw bursts of classic J80 fast reaching and lots of spray from Jemini (J80) and some classic “Finn Style” upwind sailing from Hellaby as the wind began to increase. Best to drop the jib and keep the light weight 1/4 tonner on it’s feet it seemed. Even under main alone, she was not slow on the beat. With Race three of five now complete, there are some consistent performers to note in the results and some boats who will be looking to discard today’s result from the series score. Next week’s results will see who is best placed to get their hands on the “Pirates Cave” prize vouchers from the event sponsor. 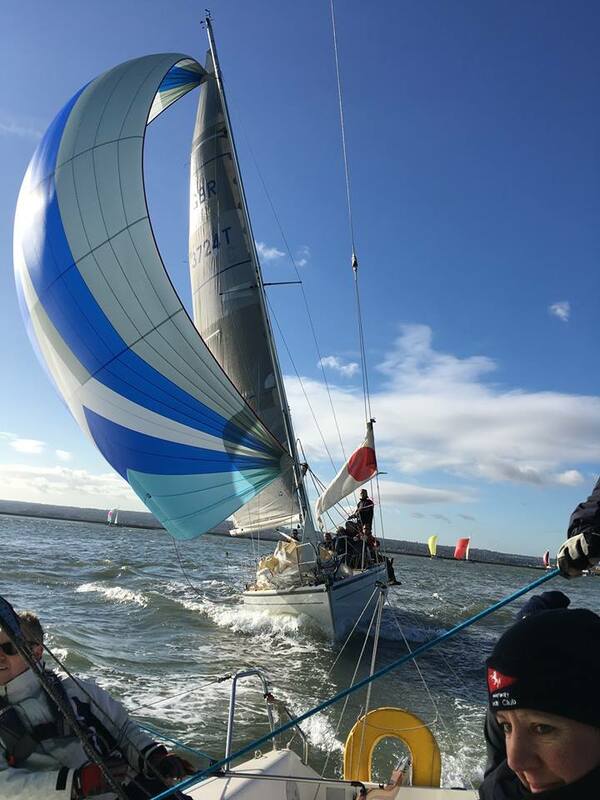 Sunday 5th November was Race 2 of the 2017 Medway Cruiser Class Autumn Series and provided crews with cold temperatures and bright sunshine, with a westerly wind of 11-18 knots. After a decent upwind and upriver start, Full Tilt (Arcona 400) led the Class 1 fleet back down river, leaving the rest of the fleet to bunch up behind, whilst hugging the north shore down to the Folly (bouy 25); all in any attempt to chea…t the incoming tide! Leading the chasing pack were Jemini (J80), Big Zipper (Delher 34) and Reefer x (X99). Once past the fort Reefer x elected to go north to dodge the tide, leaving a trio of Delher 34’s (Big Zipper, Zephoros and Valkarie) to run along the south shore. All seemed settled in their race strategies until some sort of luffing match (?) saw the three Delhers and Jemini reach up hard to the north shore – talk about banging both shores on one leg! Most impressive. Or was it intended? Once round the pier by bouy 15 , it was apparent from looking at Full Tilt, that the reach to bouy 13 was too tight for the kite but as ever Reefer x did not see the obvious and had yet another spinnaker mishap, as they had a full on broach, pinning the boat on its side. Back down the race ladder they went as the rest of the fleet sailed through on a two-sail reach up to bouy 13. The next leg was the first of two sparkling spinnaker runs down to Blackstakes, before beating back up wind to bouy’s 12, 14 and 13, prior to repeating the run. By the time the second Blackstakes run was complete, Full Tilt was long gone (again), leaving a race within a race as Reefer x led Big Zipper, Zephoros, Valkarie, Vegas (J92) etc, back up wind to the finish by bouy 29. Class 2 boats sailed Course 23 with Petite Fluer (Ecume de Mer Prototype) leading Scout (Folkboat), Ynot (Splinter) and the evergreen Suntrek (GK24). Good to see the class 2 boats all relatively close on the water. 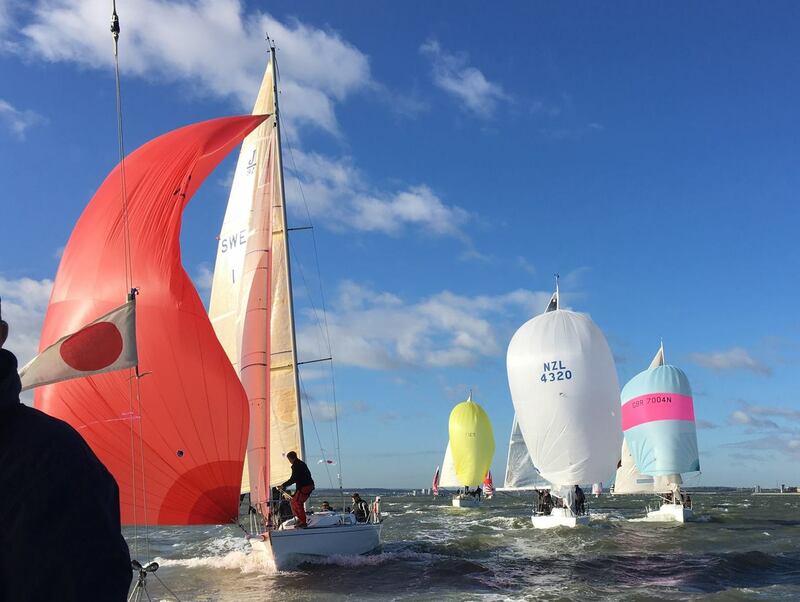 Twenty-nine yachts entered the 2017 Medway YC Cruiser Class Autumn Series, which started on Sunday 29th October and will run over five weekends until late November. The event sponsored by “Pirates Cave Yacht Chandlers” is typically the highlight of the annual cruiser class racing and as such is keenly contested by all participants. With a northerly wind ranging from 12 to 16 knots, Principal Race Officer Mike W…allis was faced with limited options in terms of finding an upwind leg, but none the less managed to set one, with a short beat up-river to buoy 31. The Class 1 start was very keenly contested, resulting in a General Recall before getting away cleanly on the second attempt. Once round buoy 31 the fleet headed downriver to buoy’s 15, 13 and Blackstakes. Initially spinnakers were hoisted, however, the reach became increasingly tight and as soon as they were hoisted, boats began to drop them as the reach became a fetch. 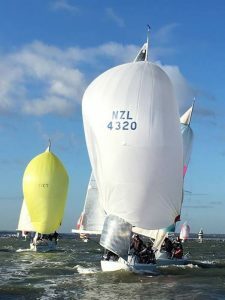 In Reefer x (X99) case the spinnaker was dropped a bit too quick ending up in a major trawl for fish and the loss of significant time and distance on the leading boats. As ever Full Tilt (Ancona 400) was at the front but this time faced with a new adversary in the form of Stephen Hendry’s newly acquired Flying Fish (First 40.7), both boats using waterline length to good effect on the various fetch and reach down river. The battle between the two forty footers will be something to watch over the coming weeks. Whilst fetching and reaching is not necessarily tactical, constant sail trim was very important to all boats if they wanted to be rewarded with speed gains over their close rivals, the reaching conditions keeping the fleet relatively close together. At Blackstakes the fleet had to complete two small triangles between Blackstakes, North Kent and South Kent, before heading back up river (via Stangate Spit, 12, 14 and West Bulwark, 16, 18, 19, 26) to the finish. All marks were keenly contested with on-the water place changes at each turning mark. 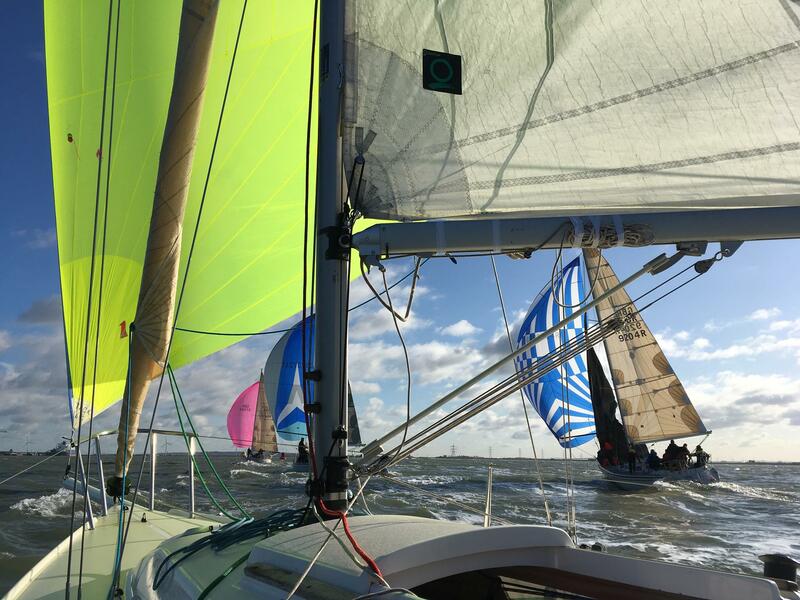 Whilst not a vintage race – a rewarding sail none the less. Full Tilt led the Class 1 fleet home convincingly, followed by Flying Fish, Irene (Dufour 34), Reefer x, Big Zipper (Delher 34) and Vegas. Class 2 boats had a shorter course with Stangate Spit being the downriver turning mark. “Petite Fleur” (Ecume-de-mer Prototype) led the fleet home, followed by “Ynot” (Splinter 21), “Scout” (Int. Folkboat) and “Suntrek” (GK24).